3. 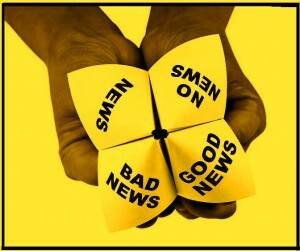 Why does anybody want the good news first, knowing that the bad is sure to follow and maybe sour the mood? When the good news is simply a seesaw offset and not specifically damage repair or a product of a short attention span, things get a tad more complicated. This is because in this scenario, a key question for any given individual is this: Which carries the greater psychological weight for this individual—the primacy effect or the recency effect? That is, which has more emotional, cognitive, volitional or behavioral clout—the first thing in a sequence, or the last [assuming they are not equal in impact for that individual]. Without knowing the answer for a particular employee, applicant, etc., answering on the basis of “human nature” will be a mistake and a source of confusion. So, how can you tell which effect will be the more pronounced for a given individual—that which comes first, or last? There are basically two ways: First, engineer the situation so as to create an overwhelmingly strong first or last impression for virtually everyone, e.g., some spectacle; second, tap into any subtler identifiable personal, individual biases toward primacy and recency effects. Possibly—and I mean only possibly—an individual’s identifiable preference for immediate, as opposed to delayed, gratification can provide a big clue. a negative time sense because of which immediate gratification is not only desired, but also seen as imperative. This amounts to an expectation that good things don’t last or can be snatched from us at any time—suggestive of the attitude of an infant weaned too early or not fed on demand. a marked preference for or dependency on fast food, fast Internet connections and other modern instantaneous conveniences, manifested as marked impatience with delays. general pessimism and expectation of bad things in the later, long or final run. For the purpose of organizational news management and presentation, consider the following possible combinations of bad-good news preferences and primacy-recency effects [discussed in Part I]. 1. Good news first + primacy effect: This obviously makes sense for anyone who responds most strongly to whatever is presented first or in a situation in which the presentation overwhelmingly creates a primacy effect for most exposed to it, ensuring that the good news will be the takeaway. This combination can, as researchers have suggested, buffer the “negative affect” of the bad news, as well as provide positive reward and incentives for staff. Example: The company, organization or political party introduces the good news with a marching band, a barrage of balloons, a special guest appearance and a thunderous song. 2. Bad news first + recency effect: This also obviously makes sense, since anyone with a stronger reaction to the last thing in a sequence will, here too, have the good news as the dominant takeaway. This combination can have effects similar to those in #1, but with even greater muting of the negative affect—not without risk of over-muting. This combination is most suitable for incentivizing and rewarding staff with a lasting feel-good moment. Example: A muted dressing down of the staff at the beginning of a meeting, but a standing ovation from management at the end, after presentation of the good news. Notice that strong recency [and primacy[ effects can be created at will, virtually independently of any personal, individual susceptibilities to either. 3. Bad news first + primacy effect: While the research suggests that those who need or want to take remedial or coping action to offset the bad news will prefer to have it last or at least are likely to have it presented to them last, it is possible that in a situation in which the primacy effect is more pronounced than the recency effect, the remedial resonances will be stronger when the bad news is presented first, not last. This is simply because it will have a stronger impact when first in the news sequence. This is the most remediation/punishment-oriented scenario. Put into practice, this conjecture could be tested by pairing the bad news with some dramatic context, e.g., an unexpected appearance of the company CEO at a branch-office meeting, paired with the presentation of the bad news. This is likely to create a very strong primacy effect, irrespective of any personality sensitivities to primacy or recency effects. If the goal of the news announcement is to induce a strong commitment to improvement, this combination of primacy effect + bad news first may very well be the best format for accomplishing that. 4. Good news first + recency effect: Again, like the other combinations, this can be engineered, irrespective of personal inclinations to respond more strongly to primacy. Like the bad news first + primacy effect combination, this can be a very effective way of advancing an organizational staff remediation/punishment agenda, the main difference being that the remedial impact may be less intense than the bad-news-last [i.e., neutral news or good-news-first] + strong recency effect combination. Having analyzed the ideal order of good-bad news presentation and personal sequencing biases to this depth, I still don’t know whether this next observation is good, or bad, news, but am certain it must come last.